6 Easy, Daily Marketing Steps that WINS Customers! A Daily Marketing Routine that Works! You are great at what you do – looking after your clients with as much care as possible. The thing is that you also need to give your business that loving care to grow your business and keep the clients knowing about you, what your business offers and be on the front of your potential clients minds. So that when the time is right for your prospects, they will ring you knowing your business can help them to solve their problem. So what do you need to do, as a Service Professional , to nuture and grow your business? The answer is to do regular, daily marketing – get into a routine, spend 30 minutes a day , 5 days a week , keeping in contact with your important contacts to build relationships and awareness of your business. Keep your contact relevant and of a great quality. Marketing is always about relevancy and quality. It is about building relationships and trust. Trust is really important. People do business with people they trust. The 5 Easy Daily Marketing Steps that WINS Customers is your daily marketing system that builds connections with your audience, prospects and clients. 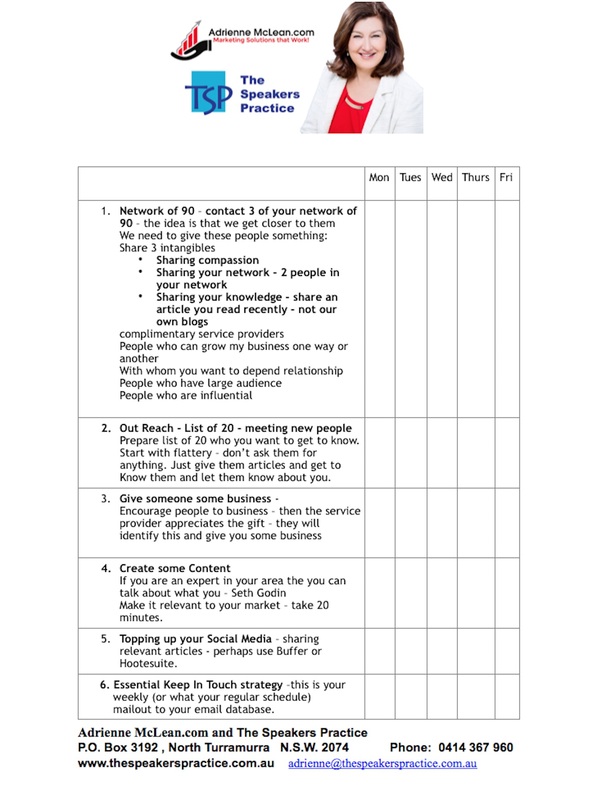 Detailed here are the steps plus a Checklist – print it out and just check off the tasks – start to notice the impact your daily marketing routine has on connecting with the people in your database. By sticking to this for a minimum of 21 days, the routine will start to be included in your daily systems – it will help you build connections and awareness and ultimately get you more clients! Do this Daily routine every working day and the impact will be evident. This protocol is based on the international marketing system – BookYourselfSolid – a marketing system that has been proven to generate business. Adrienne McLean is a BookYourselfSolid Certified Coach. Here are the 6 Easy, Daily Marketing Steps that WINS Customers. Look at Your network – Create a List of 90 –Look at the people in your network and create a list of people who can grow your business in one way or another. These are people you want to have a business relationship with who may want to do business with you or be able to assist. The list doesn’t need to be made up of solely potential clients, included in the list there may be people who have a large audience and who are influential. a. Your compassion – just say hello and check in – it may be their birthday or celebration of some sort – see how they are getting on – they will appreciate you thinking of them. b. You can share your Network – connect two people who may be able to help each other or have businesses with some synergy. This demonstrates you are connector and a person of influence within your industry. c. You can share your knowledge – an article you have recently read or one that you may think may be of interest to the person – not your own blog but someone with a complimentary service. d. Events and services you are offering – try and not to do this every contact as that is deemed selling and this connection is all about building connections and trust. You also have a Keeping in Touch strategy that this is for – we discuss this later. This activity grows your influence and you start to build awareness of your business with people who may be able to assist you to grow your business. Start with flattery – don’t ask them for anything. Just allow them to get to know you and then build your connection. The list of 20 is connecting with one on this list per day for one month. Once you have built a connection with them, you can move them up to the list of 90. You can be working on a blog, writing an eBook or a newsletter. You can create a video or be working on one. Small amounts of content can be put together to create a book! This content work demonstrates your credibility on your topic. Perhaps, putting together a Presentation. Your content shows that you are an expert in your field. Spend 20 minutes on creating some content and watch it grow! Keeping a presence on social media , in areas that your target market may be , keeps you front of mind. That is what marketing is all about. You can post articles, motivational quotes, things going on in your world and topics that your business is interested in. You may send out emails to your email database or send out an e-Newsletter. This is probably done once a week – you need to set up expectations – tell your audience how many times you will send out your business emails. Once a week is OK and not too many , if you want to do more , you can try but your unsubscribes may be start to increase.One group email per week for three weeks and then one newsletter on the 4th week is a good protocol. You have to work out which day works the best for your business and your target market. This is much more promotional and will detail your products, services, events. By working on each of these steps in the 6 Easy, Daily Marketing Steps that WINS Customers! , this will grow your connection with your clients. You will find business that will surprise you and you will build the trust with your database that will grow your business. Its important to have great marketing, attracting those you are meant to serve. That’s where The Speakers Practice can help. If you would like further assistance, email me on adrienne@thespeakerspractice.com.au and have a look at our site www.thespeakerspractice.com.au or ring on 0414 367 960. The Adrienne McLean.com and The Speakers Practice offers continuous improvement approaches for small business – we offer Marketing, Public Speaking , Video, Content Marketing, Sales Presentation Skills training and Interview Skills Employment programs. These programs are designed to help professionals grow their business – giving a structure around marketing and sales. These programs are designed for service professionals like Accountants, Lawyers, Financial Planners, Health Professionals. We guide you from uncomfortable to confident with marketing, sales and to successfully be able to talk about who you serve, what you do, what you offer and have successful sales conversations. Workshops – we offer Presentation Skills program – the SpeakersTrainingCamp®, Presentation and Video Program, Marketing Masterclass – BookYourselfSolid®, Video Marketing masterclass, Employment programs – these programs are designed to give the Professionals confidence and skills in marketing themselves. Coaching – this is the continuous improvement program – the Succeed program uses a continuous improvement model and the BookYourselfSolid Marketing system. This can be done one-on-one , on line or in a group. OnLine Training – here we offer training programs online to assist Small Business Professionals.